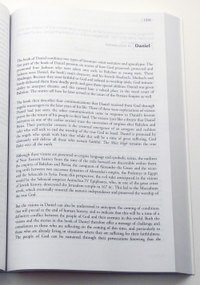 The project is styled as a "presentation" of the Bible, highlighting the novelty of the approach. The Books of the Bible is meant to encourage a new way of seeing. Instead of focusing on the verse or the chapter, the emphasis is on whole books. This is music to my ears, and it's no surprise that since this project debuted, I've been getting lots of e-mails asking, "What do you think?" After spending some time with the Books of the Bible, I'm ready to answer. Conceptually, I love what I see. The thinking behind the formatting and organizational choices is made explicit on the Books of the Bible site, and I appreciate the way it's positioned. This isn't a Bible to replace all others. Instead, it's a new way of approaching the text, stripping away some of the additions that have built up over time. A lot of people -- myself included -- complain about proof-texting and the tendency to read Scripture through a microscope, importing significance to the subtext and letting the text go unnoticed. But here's an effort to do something about that. I admire the courage it takes to say, "Here. This is how the book is meant to be read." When I taught through the Pauline epistles chapter-by-chapter, I organized the books chronologically instead of following the traditional line-up. So the way the Books of the Bible re-arranges the material makes sense to me. Combining Luke and Acts? Great idea. The new sequence works, and for those of us familiar with the traditional order, it shakes up our set notions sufficiently to provoke a "second look" at what we thought we already knew. Dividing the Old Testament into Covenant History, Prophets, and Writings makes a similar sense. I don't want to exaggerate the gains these changes provide. Traditionally-formatted Bibles -- even the old double-column, verse-per-line, self-pronouncing ones -- are far from unreadable. You won't open The Books of the Bible and be astonished. Typography and format are subtle influences, so the sea change is moderate, in some cases imperceptible. The biggest shift, for readers already familiar with the Bible, is the removal of chapter and verse markers. No, I wouldn't want this to become standard. We rely on these tools to much to abandon them. But spend some time with The Books of the Bible trying to locate familiar passages and you'll find it isn't too difficult. In fact, I found myself doing something interesting -- something I suspect would please the folks at IBS immensely. Instead of hunting for passages using numeric tools, I had to rely on the logic of the passage. I find the format useful and challenging. With the same challenge to meet, I might have made different choices, but The Books of the Bible impresses me as a concept that's been thought through from the ground up. The decisions make sense. The form of the book is pleasing, too. It's a glued binding on inexpensive paper, and there's a distracting amount of bleed-through, but this is a $9 paperback, after all. It opens flat and has a good heft. It measures 6 x 9 and it's a little over 1.5 inches thick. A handful, yes, and since the cover offers no rigidity, it can be more than a handful when you're stretched out on the couch trying to read. The size is a trade-off that earns you comfortably-sized type. You knew this was coming, didn't you? As much as I like the concept behind The Books of the Bible, there are a few things I really wish they'd done differently. They're minor enough to go unnoticed by a lot of people, so I don't think they destroy the project or anything melodramatic like that. But they prevent this from being the "go-to" edition when I want to approach Scripture as a reader. It all comes down to type. As I said, the type size is generous. But the type choice is egregious. The biblical text is set in a somewhat scripty font, with little calligraphic serifs. Maybe egregious is too strong a word. Using a cursive type would be egregious. This is just ... mildly disappointing. The book introductions (pictured at right) appear to be set in Garamond, and they look quite nice apart from the HTML-ish double-spacing between paragraphs. I wish they'd chosen to use the same type for the text -- or flip-flopped the two. As it is, the typographer in me can't help grinding his teeth a bit. Another unfortunate drawback is the lack of margin near the spine. As you can see in the photograph above, the inside edges of the text disappear into the gutter. This is a common problem, but alleviating it would also solve an issue with the single-column text setting -- namely, that it's a bit too wide. On a 6 x 9 page, a comfortable width of a single column of text is about 4.5 inches. I measured a sampling of 6 x 9 trade paperbacks and found that to be roughly standard. The Books of the Bible stretches its column to 5 inches. In a context where readability is the goal, a lack of proportion on such a fundamental level is a real disappointment. There are always trade-offs in design, but in this case I think I'd have settled for a thicker book with a layout better proportioned to the page. Having said that, I hope you won't let the shortcomings outweigh the benefits. One of my passions is to see more Bibles for reading rather than reference, and The Books of the Bible is clearly a great example. It's bold in conception and stumbles slightly in execution, but overall, I am pleased with what I see. This is a Bible designed to introduce new readers to Scripture, and to teach those already familiar with it a new way of reading. I hope what the IBS has done here will serve as an example to others. If we really are dissatisfied with the way Scripture has been read (and not read) in the past, we have to do more about it than simply lament. The Books of the Bible shows that format and design -- often dismissed as aesthetic irrelevance -- have a contribution to make in the quest.